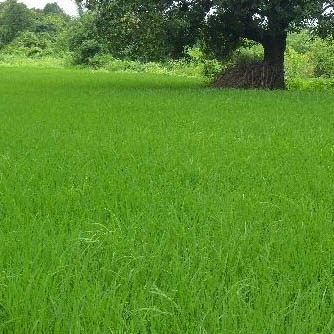 2 hours drive from Mumbai (Mumbai – Nasik Highway 75 KM). Load the bait, cast your line and wait. You are in your own solitude. Earlier you were lazing in hammocks, or strolling along the river and now you're reflecting, removed from the city madness! Just then you feel a tug at the line, and we promise that you heart will jump a little. 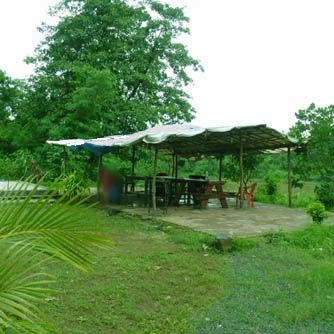 Our vasind campground promises homely hospitality. Consider this destination to add trekking, fishing or kayaking to your camping holiday. Experiences included in package: Moonlight Kayaking, Camping with Barbecue Dinner and Breakfast. (Includes - Moonlight Kayaking 1 hour, Overnight Camping Experience, Barbecue Dinner and Breakfast). for more details about campsite and standard packages on other days scroll down. 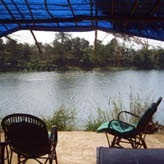 River Side Campsite at vasind is a homely escape just outside the bumbling Mumbai cityscape, at vasind. The destination is flanked by the Mahuli mountains and the lovely Bhatsa river ambles by camp. Yoga in the lawn, hammocks amongst chickoo trees are appended with clean toilets and showers giving camp the familiar BRT. Our campground currently has just two sites for upto four people each, each site outfitted with picnic tables and lanterns to light your space. Our common areas have games and puzzles, and the thrill of playing "Jenga", "Taboo" or "Scrabble" in the outdoors is a must-experience. Plan some reading, sketching or other do it yourself activity ideas and enrich your experience. Showers and WCs are common to campers. These are well maintained to suit urban standards. Easy Adventures offers a range of activities around camp. Some of these activities are free for our campers and some chargeable but all of them are worth the indulgence. Give your self to the experience and you'll find something within! 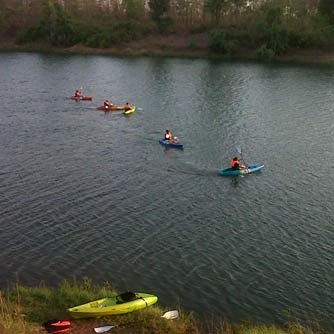 A range of Kayaking activities are conducted from a 1 hour guided kayaking and training (Rs. 300pp) to a 4-5 hour Kayaking safari - flowing downstream with scenic breaks and a packed snack (Rs. 1200pp). For those inclined on doing something different, moonlight kayaking (Rs. 500pp per hour). Note: All adventure sports are subject to weather conditions. Indulge in rod and trap fishing in the day and lobster fishing at night on the house. Consider this our contribution to your fishing endeavor. Make the effort to get into the activity and our instructors will ensure an authentic experience! To complete your fishing expedition, we will plate your catch for a nominal additional fee! The Mahuli mountains are a trekkers paradise. An outstanding imposing range towering over 2000 feet above the highway, these hills are a quick 20 minute drive from camp. You will be famished after the trek and just in time to cool off in the river and enjoy a sumptuous wholesome BBQ dinner. We can arrange for someone to show you the way and carry a small first aid kit for a nominal fee. In the water @camp You must, of course swim in the river or indulge in tube rides. Our camp hosts will take you to where its safe. Live the camp life. *Easy Adventures is a professional adventure outfit conducting adventure activities for patrons including Offbeat patrons. Please follow instructions by Easy Adventures Guides. There are at least three meals that you need to plan for your stay at Big Red Tent vasind. While a simple breakfast fare is offered, you will want to plan lunch, dinner and an evening snack. A Village cooked meal can be arranged for you if we have enough takers at Rs.300 per. head. A simple breakfast is included with your camping charges. Available from 9:00am through 10:30 am. Cookout. Guests have made great meals at the campground. With a little effort this can be the highlight of your trip! Ask us for a stove (Rs.100 for a meal) if you want to cook. We will help you however we can! Sandwich lunch. A light sandwich lunch with dry ingredients and cheeses is a great idea! You can carry this to a late afternoon snack with tea as well! Baked beans work very well too! This winter our River Side Camping at Bhatsa promises to deliver the camping experience with just a little added amenity. You can enjoy a close connect with the outdoors with us the winter with campfires, barbecues and an ambience that you have come to love!! As an introduction to camp life we provide tents, a sleeping kit, access to our common areas and games, a site rental, a simple breakfast and an experience to cherish all packaged into one price. Meals are charged at Rs.200* per meal for kids under 8. Note; December 31st, 2015 night (New Year Special - Tariff Rs.4500/-; Eleborate Menu and Preparation for New Year Camp). 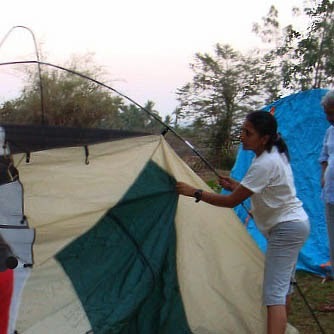 - Drop us email at natureknights@gmail.com for New Year Camp Brochure..
Day Trip Camping: A day of camping has a check-in time of 9:00am and a checkout time of 4:00pm. 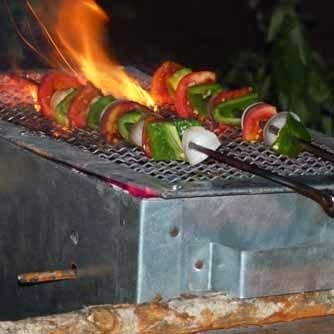 You can request for some evening snacks and BBQ dinner at an additional cost and we will be very happy to oblige you. 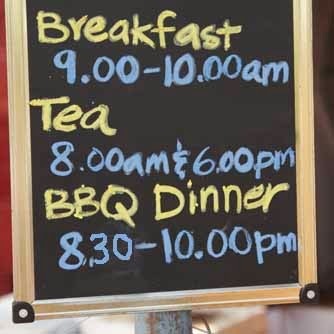 We include breakfast and lunch in our pricing. A simple breakfast is included with your camping charges. Available 9:00am through 10:30 am. A sumptuous home cooked meal can be arranged for you. Barbeques are offered on most evenings.Non-veg barbeque has 300g of chicken & Veg barbeque has paneer and assorted vegetables. With dal, chutney and roti this makes for a sumptuous meal. Further we have potatoes, sweet potatoes or corn as per availability to grill at the campfire. Please call / SMS +91 9619182010 / asif@natureknights.net for booking and queries (customised Corporate Offsite / Students Outings / Group Outings). We require prior booking and payment to help us plan to service you. 2. Please drive at max 5km/hr in the campground premises. 3. Our timings are: Check-in between 8am and 8pm & Check-out by 10:30am the next day for a night of camping. We enjoy your company at the campground and we don't have very strict check-out timing rules. All the same, if we need to allot the site to guests coming post checkout time we will request you to vacate. 5. Playing music at the campground is not permissible. 6. No unauthorised electrical appliances at the campground. Please check with the manager before using your devices. 7. Pets are not allowed at the campground. 9. Please leave the Tents pitched and the sleeping bags in the tents for our checkout procedure. Please ensure that you return all rental items before leaving the campground and leave your campsite neat & tidy. What exactly do i get when i rent a campsite? You get a space furnished with a picnic table. You will also get a tent based on the number of people and sleeping kits for each person. Further this gives you access to all our amenities and common areas as well as service in the outdoors! What if i have my own tent and no sleeping bags? You are most welcome to bring your own equipment. We want to encourage experienced campers!. You will get a per person discount of Rs.100 for your tent and Rs.100 for your sleeping bags. What is the weather like? Do we need to carry any special kind of clothing? Be prepared for the outdoors. The evenings can get chilly in winter. A single sweater should do the trick. The afternoons can get warm through the year, so carry some light clothing too! Refer to our PREP KIT pdf for details on what to carry. Are there a lot of bugs, snakes and creepy crawlies around? Are there electrical plug points available? No, you could request the hosts for a place to charge your cellphones. Is there cell phone signal? There is very little cellphone signal only at a certain place at the campground. You cannot depend on this. We have a phone on site that you can use for short calls/emergencies. Please leave the number: 02194-205074 with your friends/family so that they may reach you. Making too many outgoing calls engages the phone which should be left available for incoming calls. What about drinking water?Can we buy some basic supplies at the campground in case we've forgotten something? Drinking water and Mineral water will be available at the campground. We accept credit / debit cards bookings only if done minimum 4 days in advance. No credit cards / debit cards accepted at campsite. Do you have sites so a group / corporate / education institution can camp together? Do you offer any discounts for booking the entire campground? Contact us about group camping for 20 adults or more. We will work something out! Do you allow dogs?/pets? What's Petiquette? We do not allow pets at present. We will experiment with pet days. Do leave your contact details with us.